When it comes to feeding hedgehogs, there is a lot of poor information out there. A lot of foods commonly given to wild hedgehog by well meaning members of the public are actually bad for our spiky friends and can actually make them ill. If you are looking for a good food for wild hedgehogs, I recommend you try the Spikes range which is available from Amazon. We have tested a load of different feeds and this one comes out on top for us. 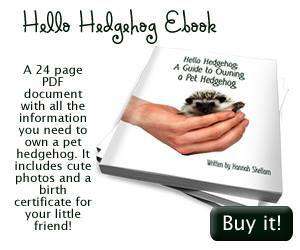 Just as us humans have different metabolisms, dietary needs and preferences, so do our pet hedgehogs! A Pygmy Hedgehog’s diet can be made up of meat or cat food (a mix of dry & wet), mealworms (alive or dead) and a little bit of fruit & veg. A Pet Hedgehog’s staple diet should be mostly dry cat biscuits. You can buy hedgehog foods in some pet shops and supermarkets but this type of food is usually for wild hedgehogs, and because of this it is too fatty for our little pets! Many hedgehog owners buy high protein cat food and mix dry and wet together (¾ dry ¼ wet). When you’re choosing food for your pet hedgehog you should firstly ask the breeder what they have been feeding your friend. It’s a big change for a hedgehog to move away from its family and environment, so when it comes to you it is a good idea to give it the food it knows to try and keep a little normality in its life and reduce stress. Once you know your pet hedgehog is happy and comfortable around you, you can then start looking at other types of biscuits to feed it. Cat biscuits seem to be the best food for hedgehogs as their main ingredient is meat. (Don’t buy any fish based ones – fish isn’t safe for these guys). There are some that have cereal as their main ingredient, so you should check the label to avoid using these as the main part of their diet. Look for the fat content in your dried cat biscuits, they should be about 10%-15% and protein should be at least 30%. WARNING! Overweight hedgehogs can have serious health problems. 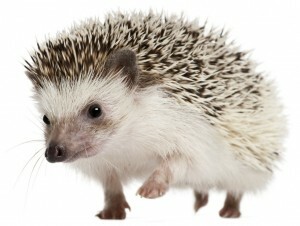 You can tell if your pet hedgehog is overweight as it will get a double chin and have fat drooping down over its knees! Along with these dry biscuits you can treat your hedgehog a few times a week. Check out our lists above of all the foods that are safe and not safe for a pet hedgehog to eat. Any meat flavoured baby foods will be safe, although things could get messy! 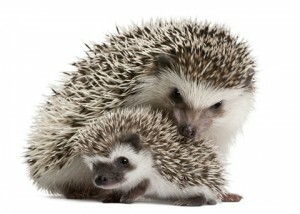 Some scrambled egg should go down well, but don’t add milk because Hedgehogs are lactose intolerant! 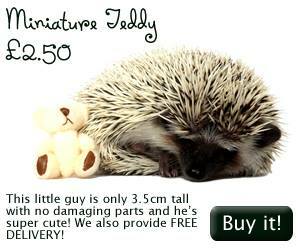 As hedgehogs are insectivores your little pal will be delighted to be treated with mealworms and crickets. If you do make a little meal for your pet, don’t leave it out long enough for it to go off and give your pet to get food poisoning. Some people feed their hedgehogs twice a day, some will do it once. Ask your breeder what your hedgehog has been eating, when it eats and how much. Usually a breeder knows best and should be available if you have any questions!